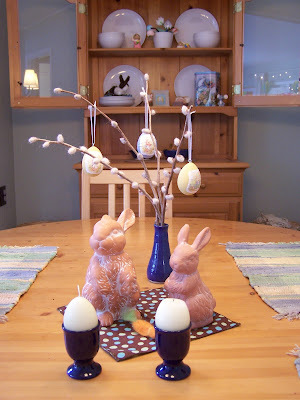 I have been freshening up our home with some Easter themed items. I decided months ago that this year my inspiration was going to come from a few of the stories by Beatrix Potter - Peter Rabbit, The Flopsy Bunnies, Benjamin Bunny, Jemima Puddle Duck and Mrs Tiggy-Winkle. 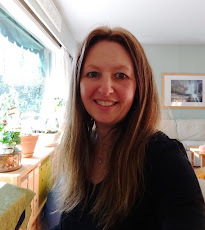 Much to my surprise I recently found out that it is the 110th Anniversary of The Tale of Peter Rabbit so I have found many things available that will add to the fun! This site seems to have everything imaginable (including fun downloadable desktop wallpapers) as well as character information and teachers resources about Beatrix Potter. I enjoyed collecting her books when I was a child and the stories have continued to entertain my children. So I have scattered bits of Beatrix all over the house. 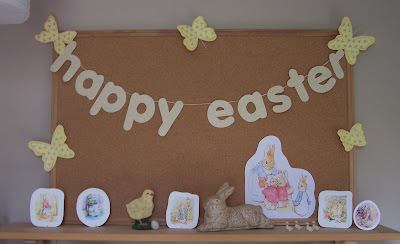 In the kids room I decorated a large cork board propped on a shelf (photographed above) with paper cutouts of the characters and added a few butterflies and a very simple Happy Easter banner. 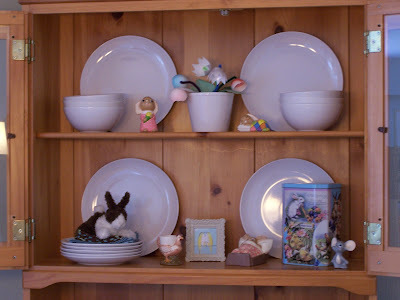 The chick and bunny on the shelf are cement figures that I painted. This small shelf display was greatly inspired by Pottery Barn who are currently carrying a lot of Peter Rabbit themed products. 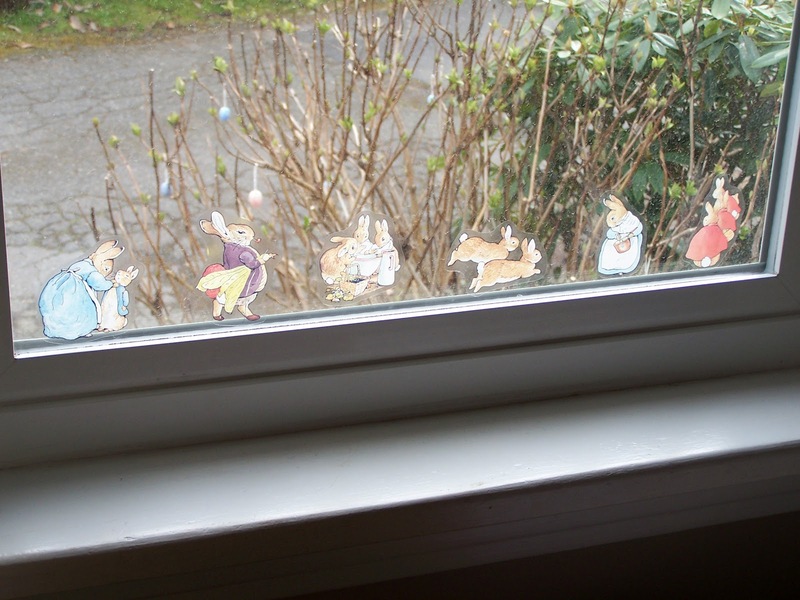 In the window I added a some reusable stickers from a book called "Peter Rabbit and his friends sticker book". 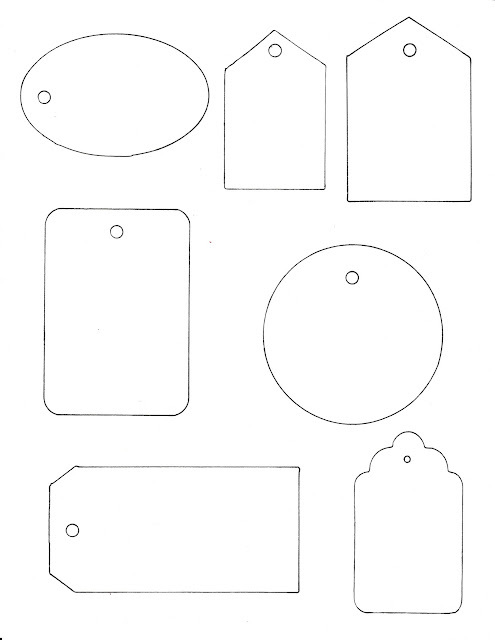 (I can't find an online source) The book comes with a fold out display for creating your own scenes as well as the story and activity pages. 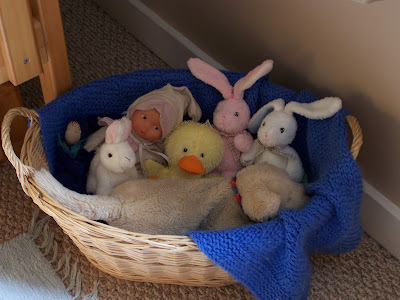 And a basket holds just some of our Easter themed stuffed toys, and to our continued amazement they are played with every day! 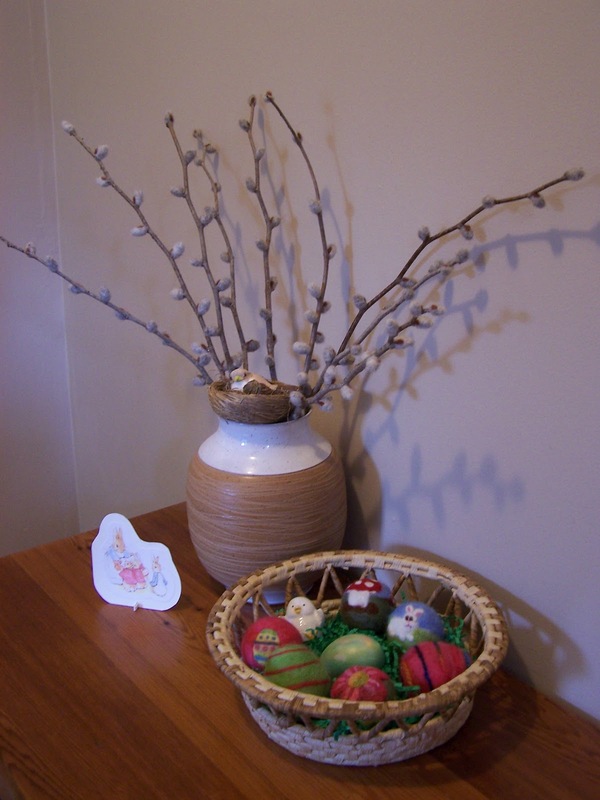 The dining room table has more needlefelted catkins with Peter Rabbit decoupaged eggs, a needlefelted carrot made by my daughter and some terracotta bunnies that have been used in our decorating for at least 15 years. The egg candles are just as old and are the only paraffin wax candles I have left in the house. Since switching to beeswax candles I don't like to burn anything else now. 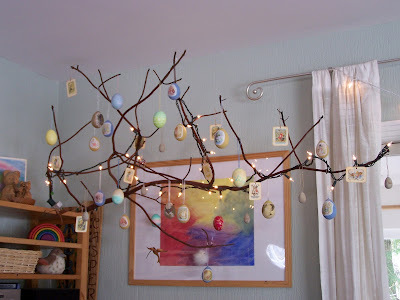 I plan to make these for next year. In the hutch I like to go a bit "vintage". This is where I display my childhood collection of bunnies (and mouse!) that my Grandmother and Great Aunt painted for me. The rooster egg cup was found in a box from my Aunt and was so popular in the 70's, I remember my Mom and her painting them. I picked up the vintage (looking) tin at the Thrift Store, I don't think it truly qualifies as vintage yet! My son made the egg shell and egg carton flowers last year in Kindergarten. For coffee table play I wanted to recreate a simplified version of Mr McGregor's garden. I gathered bits from different sets that we had and arranged the pieces on a wicker tray lined with a brown silk. 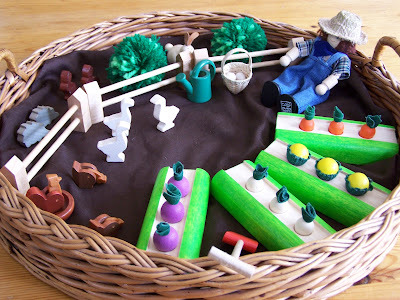 As avid vegetable gardeners I thought this theme would also tie into the Spring planting that we are about to begin! 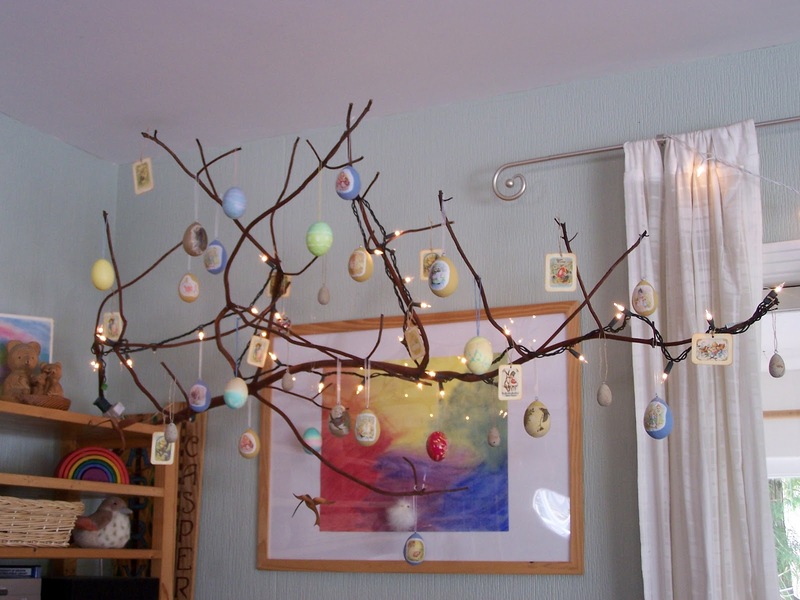 And of course our arbutus branch is laden with all kinds of decorated eggs! Some were dyed a few years ago at a friend's party, the Beatrix Potter decoupaged eggs were made this year, as well as the small wood eggs were repainted this year (they were looking a bit dated! ), the vintage stickers were another Thrift Store find so I put them on to some antiqued paper and made them into decorations. Last year my daughter's class made Pysanka Ukrainian eggs (bright pink) so that egg in particular is a true treasure! 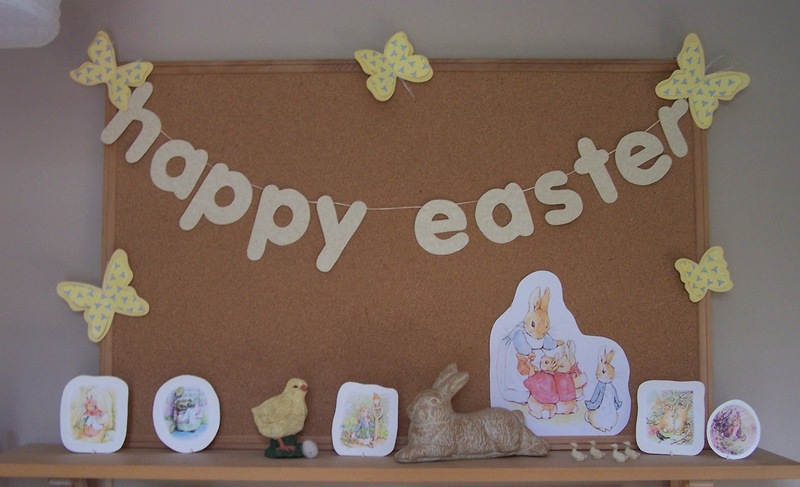 I'd love to see or hear about your Easter decorating! Love the Beatrix Potter theme! 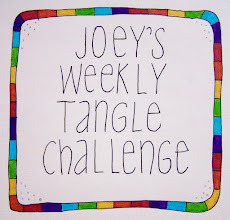 Your blog is so inspiring, I love the childrens playcorner in your home and many other things I read about your life. 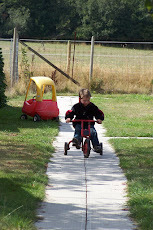 I copied the nursery rhyme, I need it for someone to cure from sorrow.